I hope everyone got their jelly rolls in or their scraps together this week. 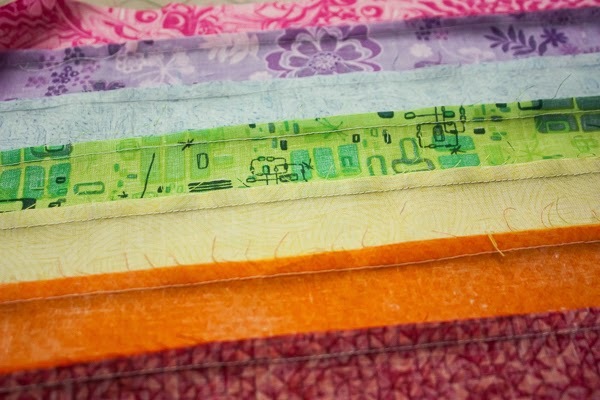 If you are using scraps remember that a jelly roll is 2 1/2 inches wide. Length won't matter as long as they are at least 6 inches long. I'd love to see your fabric choices so please share with me what you picked. I love to read mystery novels but writing this tutorial is a little different. Trying to give you just the right amount of information without giving away what we are doing is much harder than I thought. Now on to our second part of the mystery. 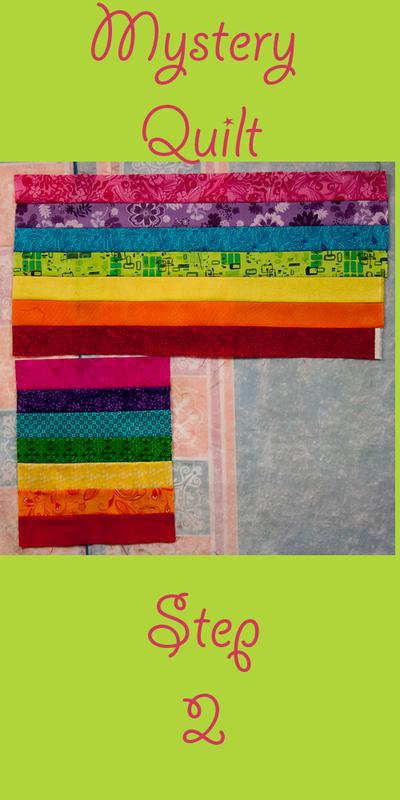 If you purchased a jelly roll you should have 42 strips. If you are using scraps, like I am, you need a total of 42 X WOF. WOF stands for width of fabric. The first thing I want you to do is open that jelly roll and sort it into 7 stacks. I did mine by color, in a rainbow sort of effect. You can do yours dark to light, by color like I did, or any way you want to. This is your chance to "design". You'll end up with 6 strips in each one of your stacks. 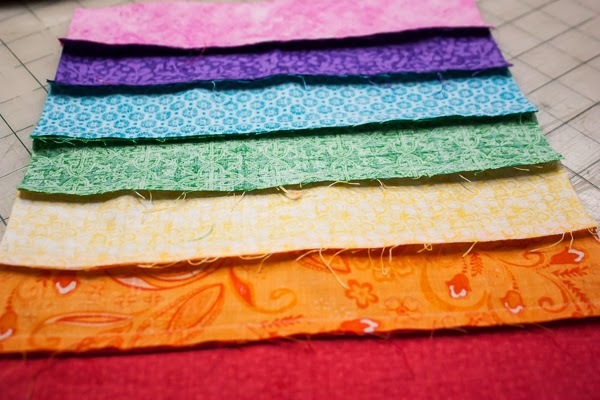 If you are using scraps make sure that you have a total of 252 inches in each stack. So if all of your strips are 5" long you'll need 51 strips in each stack. I keep a notepad next to my cutting mat and just subtract off the length of my strip until I'm down to 0. Now we make strip sets! You remember those from the piano key border right? Incase you have forgotten strip sets are just sewing our strips together. Nothing fancy and not hard. You'll use one strip from each pile moving right to left or left to right, your choice. Remember when you are sewing your strips together, with a 1/4 inch seam, to sew one strip on and the next strip turn your set around and sew from the other end. Otherwise you'll get this odd bow in the middle of your strip set and no one wants that. You'll make six strip sets total. When you press your strip sets open you'll want to press 3, or half, away from the first strip and the others toward the first strip. This will help make sewing in our next step easier. That's it for this week.